25+ Camping Games For Adults + Kids That Are SUPER Fun! 25+ Camping Games For Adults & Big Kids that are WAY too much Fun! The magical effect of summer and being outdoors makes us all come together to laugh, explore, and even turn off our electronic devices. It is one of the only times where the inner kids in us get really excited and forget about daily life, and truly be in the moment. All year we look forward to those fun campouts and playing our favorite camping games together. After years of camping with our families and having countless good times with outdoor games is what excited us to create Backyard Games. The best camping games get everyone active, energized, and most importantly, socializing. A lot of the games we mention below can be played by anyone, some may be a bit too strenuous or organized for younger kids. However, these camping games are so much awesome that even watching can be fun. To make this even easier for you, we decided to categorize the camping games as outdoor camping games and kids camping games. For our outdoor drinking games you will need to see our other blog. Skip to kids camping games, or keep reading. You know how we love our backyard games, but sometimes with a limited space in the car we cant pack that many games to bring. With the abundance of outdoor space, soft grass and dirt with no concrete, and nice shaded areas camping is a perfect place to get your game on. 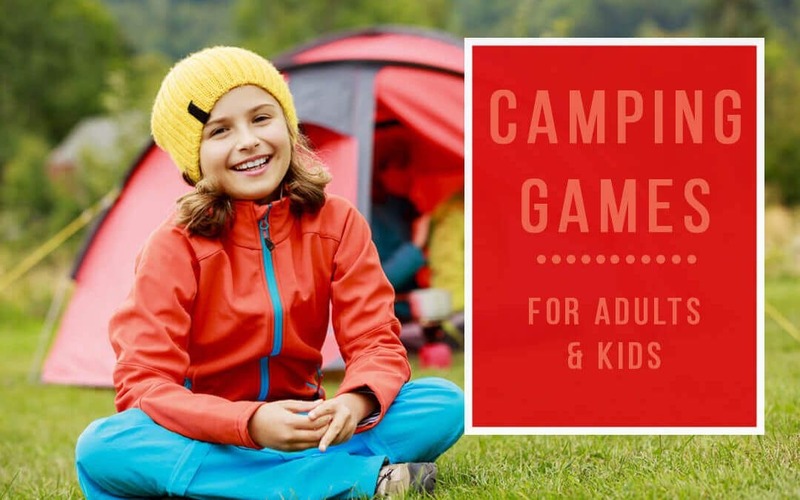 We wanted to keep this post for under 10 outdoor camping toss games, but make sure to view our full outdoor games list for 68+ further game suggestions. Bocce Ball is one of those camping games you can literally play for hours. Playing in the open areas with roots, divots, trees, squirrel holes, and all types of random obstacles. The bocce ball rules are really simple, essentially you are seeing who can roll their balls closest to a target. At the same time, you are knocking each other our of the way to be the victor. Even though this will provide hours of fun, it takes up a relative small amount of real estate in the camping van. Most of us remember playing Bocce Ball while camping or at our grandparent’s house as kids. The best part about it is that many of us have the same sets that were handed down to us. A good set of Bocce Ball will last for years, so when looking make sure you do not go for a cheap plastic set. Get the price. A common feature of a lot of camping grounds is they probably have a horseshoe pit already setup at the campground! Every year we play horseshoe at our family campout, where we all play for a trophy and championship. It is a 2 or 4 player game, where you try to throw your horseshoe closest to the ring as possible. The rules of horseshoes are super simple and easy for all ages to learn. Portable horseshoe games for kids are a good solution, because as adults lets be honest that you need an actual wood box around the ring to make it a better game. If there are no horseshoe pits at your campground, here are 7 games like horseshoes. Kan Jam is one of the classic frisbee games and is nice to play when you have some open space because you stand approx 50 feet apart. As a bonus it is a fun game you can play with a drink in your hand. It is a 4 player game where teams take turns throwing a Frisbee towards a garbage can like basket to either hit, land in, or get through the front for an instant win. The fun team aspect is that your partner can deflect the frisbee so no waiting around. Kan Jam is something that needs to be explained in full so we have 2 other articles on the Classic Kan Jam Rules and Kan Jam Drinking Varation different game sets and where to buy. Beersbee (or polish horseshoes) is the Frisbee Pole Game where you essentially try to knock a beer can or whatever from the top of a pole. It is a 4-player outdoor drinking game that states in the rules that you need to have a beer handy while playing. This is one of the games that is not meant for all ages, but for the younger party hungry crowd is a big hit. Here are the beersbee rules and our review of the game. Get the price. One of the classic camping games that is fun for people of all ages and abilities. All you have to do is throw one of the rope rings around one of the wooden stakes to score points. It is one of game that you can easily make for yourself. There are 5 stakes of different points that you throw your rings around. Get the price. Kubb (also known as Koob) or Viking Chess is an outdoor toss games where you throw wooden mallets at your competitor’s pieces. It is one of the more complicated games and the rules of Kubb but brings strategy and athletics to an outdoor game. You need a large area, some time to play (is typically 45+ minutes per game), and meant for players 13+. Get the price. Tic-Tac-Toss is a fun outdoor game that anyone can do! Literally, as computer programming millennials we built this game for under $20 in under 10 minutes. Essentially it is the same rules as Tic-Tac-Toss but are throwing frisbees at squares instead of deciding where you want them to do. We have 2 different blogs on the DIY instructions to create the game and how to play Tic-Tac-Toss. Plus the unofficial Tic-Tac-Toss Drinking Rules. Great way to teach kids how to play the classic game of Tic Tac Toe, learning some strategy, and how to throw a frisbee. Spikeball is our personal favorite backyard game, but is one of the most active camping games we have ever played. It is a 4-player game that requires hand eye coordination, lots of running and jumping, and can not be played with a beverage in hand. It is meant for an audience 13+ that loves to run and jump. Best explained like reverse hand volleyball. That probably makes no sense so read the full Spikeball rules. All you need to know is it’s awesome. Get the latest price. Beer Pong is one of the many things that is best played outside. This way if your friends have too much too drunk, are spilly talkers, or just need to go to bed they are only steps away from their pillows. The biggest problem with Beer Pong while camping is getting your balls dirty, so you can go for a cool insert or one of the many beer pong accessories. If you are unfamiliar with the Beer Pong Rules we created a funky beer pong infographic for you to print off and have handy. There are inflatable beer pong sets, giant yard pong, and racks to make sure your camping pong goes off without many bounces. One of the best reasons to go camping is to Get Your kids to Play Outside and let them experience new things. In a day where the average child in the USA spends 7+ hours in front of a day, sometimes are kids need an extra little incentive. The camping games for kids below are active, stimulate their imaginations, encourage social skills, have them remembering numbers, and most importantly are fun. If you are looking for more games, make sure to check out the Best Backyard Games for Kids and Outdoor Birthday Party Games. You may think that we are joking, but the Flickin Chicken Game was actually designed for adults. However, once kids set theirs eyes on this hilarious game will have fun throwing chickens around all day. Once playing this, we had to write a full blog post on the Flickin Chicken Rules and where to buy. The game rules are similar to Bocce Ball, but involves hilarious flying chickens and fun filled rules. Even if your kids do not want to play the Flicking Chicken Camping Game, they will have fun just playing together with the chickens. Get the price. Earlier we talked about how much fun Bocce Ball is for adults, well Boochie is similar but designed for kids. The game play is shorter, the rules are hilarious, and you wear a wrist band that makes you do different actions. The wristband will give you some challenges such as throwing with your eyes closed, tossing between legs, and so much more. There are numerous ways to score point, but the main goal of boochie rules is to get your ball and ring closets to the target. A game that has received many awards, Boochie is rated our number one Backyard Game for Kids! Get the price. Fling a Ring is a great camping game for kids because it’s very portable, easy to learn and fun. Fling a Ring is like a combination of horseshoes and frisbee golf. Instead of throwing heavy horseshoes you throw an almost Ninja Like Star that wraps around the flag (pole) much easier. You do not need to build a pit, and easily stick a flag into the ground. The Fling A Ring rules are simple and teach kids scoring and theory as like Frisbee Golf take several throws until they get it around the flag. This game is guaranteed to be a ringer of a game for your next campout. Get the price. Growing up I am proud to say that my Grandma had given me a set of the classic lawn darts. Remember when they became illegal? I get it, the steel darts just weren’t safe. But that inspired a new era of dart throwing games, including Jarts. Jarts is like horseshoes or ring toss, but the soft tipped lawn darts are rounded and designed to stand upright no matter how you throw them. This makes it ideal on almost all soft (not hard) surfaces. This game is also really compact and portable so makes a perfect camping tag along. Get the price. Spot It is one of the top-rated board games for kids, and excited that they came out with their Spot It Camping Edition Game! Essentially you have 55 circular cards with different nature symbols and icons, and you try to match between symbols. It is a race to be the first one to spot it to win! Find matching between camping accessories, natures, animals, and much more. It works on sharpening reaction speed, memory, and make a fun social and social atmospheres. If you are looking for a “quiet time” camping game while the kids are waiting for hot dogs, this is a great option. Get the price. Scavenger hunts can be difficult to play in your own backyard when the “exploring” is always the same. Camping offers a whole new venue to explore plus learn about all the new types of nature that can be found, probably within just 10 steps of your tent. Here’s a great camping scavenger hunt printable to take with you. An all-time kids favorite camping game is playing flashlight tag. The mix between hide and go seek in teams or individuals with flashlights all amount to fun. I mean chasing kids in the dark, climbing trees, dodging holes and fences outdoors is what being a kid is made of. Did you know there are over 100 games you can play with a parachute? It is one of those games that all kids loves, and helps them meet new friends. Something about the massive colors and mushroom shaped design has kids running from all over the campground. Whether you are just trying to roll a ball throw the middle, playing parachute volleyball or popcorn the games are endless. Plus, when your kids are done playing with it, many of them just want to sit and play on it. Here’s my favorite 24 parachute games to play.